Do you know with absolute certainty that your company is well-protected from a crippling, business-closing data disaster? Are you positive that your investments into technology are rewarding you with the greatest possible ROI? And what do these two questions have to do with each other anyway? Plenty! 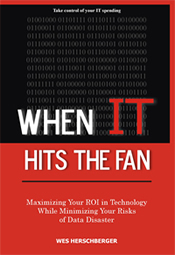 Earning a robust ROI and protecting a company from an IT disaster may seem, at first glance, to be two entirely different subjects. Readers will quickly learn that the two issues are closely intertwined and that when executed properly, work in perfect synchronicity to make more money for a company and keep it safe at the same time. Listen to PODCASTS & WEBINARS featuring Wes Herschberger. Click on Download button in the menu.